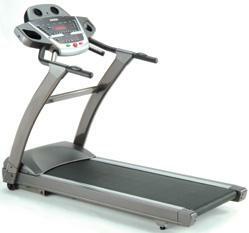 The Spirit Z700 treadmill is the non-folding counterpart of the Z500 model. Both are similar in terms of specs, features, and price. The main difference between the two, other than folding feature, is that the Z700 is bigger and more stable. Is This the Treadmill for You? If stability is what you’re looking for in a treadmill, then this model definitely has that. But before you start making your decision, I suggest you read this whole review first. You might find it enlightening. This treadmill boasts a 3.0 HP continuous duty motor which is capable of delivering speeds of up to 12mph and is also inclinable for up to 15%. So it doesn’t matter whether you’re a beginner or an advance runner, expect this machine to provide you with intense workouts. The 20” x 58” double woven 2 ply tread belt is longer than the average Spirit belt... allowing everyone of all shapes and sizes to be comfortable on this machine. And, it comes with a speed and incline control on the arm rest so you can easily adjust the intensity of your workouts. The console is a tri color LED with 6 windows to display important information regarding your run. It also comes with a 16 character message window for instructions and feedbacks. There is also has a track feature and an HR% graph for different programs. And like most treadmills from Dyaco, the Spirit Z700 treadmill has 6 auto programs, 2 user customized programs, and 2 separate heart rate control programs to give more variety and flexibility in your workouts. As I’ve said time and time again, Spirit treadmills have below average quality. And this model is no exemption. Also, I think this machine is a little overpriced. Just like the Z500 unit, I also won’t recommend the Spirit Z700 treadmill. with a price tag of more than $2,000, you’ll be better off buying the Sole S77. It is similar to the Z700, but with better quality and a cheaper price tag. If you still plan on buying a Spirit Z700 treadmill, I suggest you buy it from Amazon. You can get it for just $2,099.99.